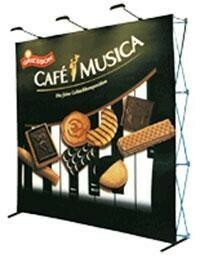 7ft High Straight Pop up trade show table top backdrop with custom graphics, metal frame, rolling trolley, and spotlight. Easy assembly. Curved faced pop up displays also available.